Regular garage door maintenance is extremely important for ensuring the good working condition of your automatic door system. This is doubly true as far as safety is concerned. Many problems with your system can end up posing a risk to you and your family members if they are left untreated. The are many answers to this particular question, but the easiest and most effective thing you can do, is to regularly examine your door for any underlying issues. Every part of your door can suffer from wear and tear damage, and making sure you catch problems early can actually prevent serious issues from developing, and will help you avoid a lot of accidents. Some general maintenance will also go a long way in ensuring the smooth operation of your system's various parts, and smooth and efficient are great for paving the way towards safe. One of the most important parts of your automatic garage door system, at least as far as safety is concerned, are the photo-electric eyes, otherwise known as the system's safety sensors. The simplest way to test they are working correctly is to place an object in the door's path, and then use the opener to order it to close. If your door reverses and avoids hitting the object, or if it refuses to move at all, then the eyes are likely working correctly. However, if your door does continue closing and hits the object, your sensors are misaligned and need to be repositioned. These components require your careful attention. You should never touch them or try to adjust them if you suspect that's what needs to be done, as the great tension they are under could result in one of them breaking and whipping around your garage, potentially damaging any person or object in its path. What you can and should do, however, is examine their coils to see if you notice any little tears and damages. If you do, then your springs need to be replaced before they snap. If you have a torsion spring and you'd like to aid its efficient operation, you can apply it with the proper lubricant every now and then, just be sure you're using the correct type. You can consult your owner's manual to be certain. Really, the best decision you can make when it comes to ensuring the safety of your overhead door is to have it tended to by professional technicians. 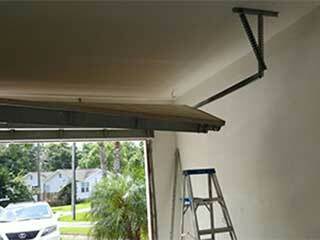 Our experts at Garage Door Repair Houston are always available to give you some advice or perform any emergency repairs. Call us today.